Fierce and wild is the wind to-night, It tosses the tresses of the sea to white; On such a night as this I take my ease; Fierce Northmen only course the quiet seas [Source]. So wrote an Irish monk in the margin of an Irish copy of a Latin and Greek grammar book that he was studying in an unknown Irish monastery in the mid-ninth century. This image of rapacious Vikings plundering church sites and other Irish settlements persists in popular culture. However, discoveries at Woodstown, on the banks of the River Suir 9 km upstream from Waterford City’s Viking Triangle, allow us develop our understanding of the earliest phases of Viking raiding in Ireland and the establishment by Vikings of permanent trading settlements on the island. The new Four Courts Press book Woodstown: A Viking-age Settlement in County Waterford by Ian Russell and Maurice Hurley presents the evidence of the excavations that took place on the site between 2003 and 2007. A series of chapters by leading Irish and international experts describe and discuss the significance of different categories of finds from the site, including silver, amber, ships nails, weights and weaponry. The Woodstown Viking settlement was enclosed by a substantial ditch up to 4 m wide and 2 m deep that enclosed a D-shaped area facing onto the river bank. The soil excavated from the ditch was piled up to form a bank or rampart on its inner edge. Postholes (the negative impression of wooden posts left after they rotted) in the remains of the bank suggest that the bank was augmented with a timber palisade. The area enclosed by the rampart was up to 450 m long and approximately 4.5 hectares in extent. Their mastery of seafaring gave the Vikings a strategic advantage commercially and militarily. The site at Woodstown was ideally suited for a settlement that relied on waterborne activity as it had direct access to the river. The River Suir, through the network of rivers now known as the Three Sisters, provided ready access to areas inland in Tipperary, Laois, Carlow and Kilkenny. While from Waterford Harbour Viking vessels could sail easily to western Britain or adjacent parts of the continent. 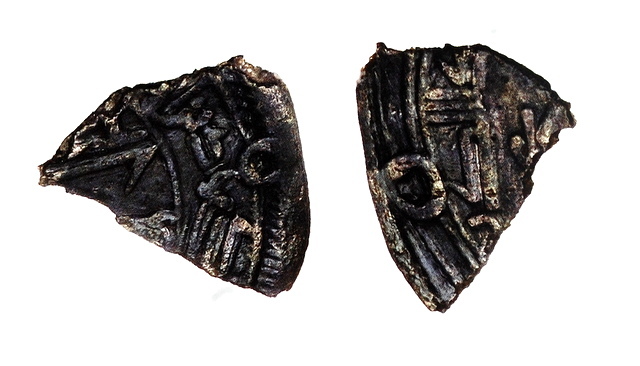 Pieces of silver and a large number of lead weights are direct evidence of the presence of Viking traders at the site. 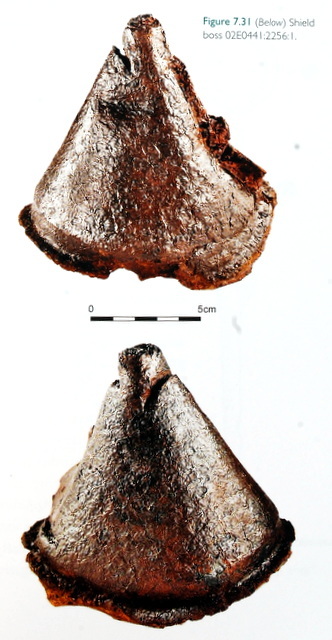 The discovery of ships nails indicate that Viking-type boats were being repaired at the site. Trade involved the exchange of silver for goods and commodities which might have included hides, cloth, foodstuffs and even slaves. 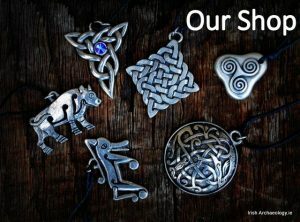 Some of the silver from the site are pieces cut off brooches which would originally have been worn by high status Irish individuals; were these brooches willingly traded by their owners or do they represent booty from a Viking raid? 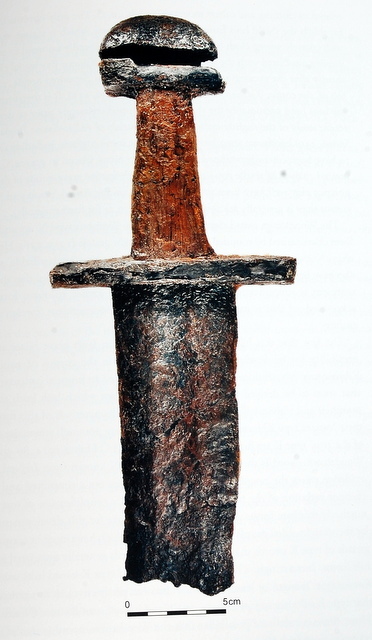 There is one piece of inscribed metalwork which might have come from a cut-up religious artefact; this is unlikely to have been willingly traded so it most likely to have come from the spoils of a successful raid on a monastery. 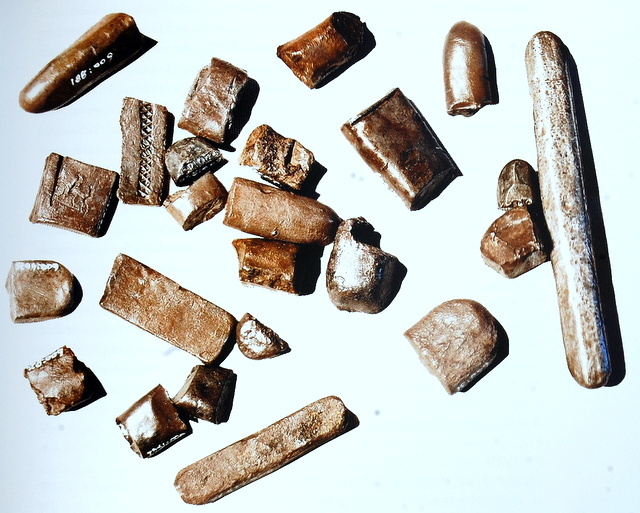 The finds from Woodstown reflect the extent of the Viking trading networks in the ninth century and include pieces of Irish-made jewellery, amber from the Baltic, silver coins from the Near East and weapons from Scandinavia. 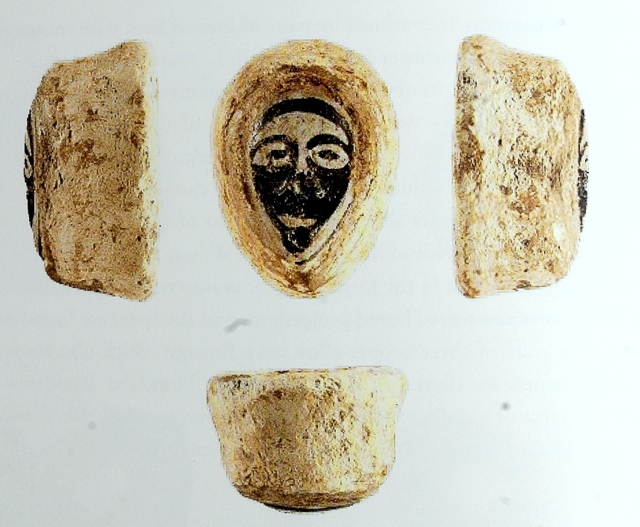 Antler combs, a possible loom weight, and quern stones used for grinding grain indicate the range of domestic-type activities that might were carried out at the site. 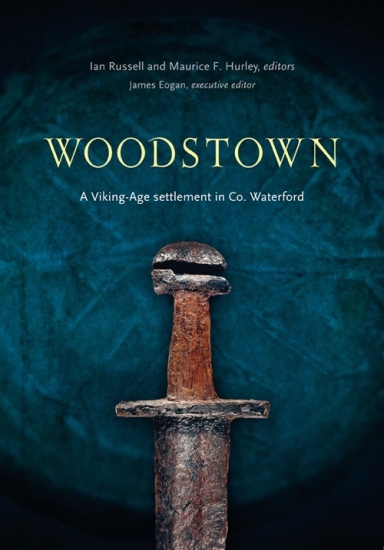 Competition The good folks at Four Courts Press have very kindly offered three copies of their new publication, ‘Woodstown, A Viking settlement in Co. Waterford‘, as prizes in Irish Archaeology.ie’s latest competition. To enter just leave a comment below (all comments have to be moderated so it might take and hour or two for them to appear). I’ll then pick three winners out of a hat (closing date from entries is 6 pm on Sunday 12th of April, winners will be notified on Monday the 13th of April). Great article, and the book looks very interesting! Looks like a fabulous book and would love to get it! I would love it too for studies and broadening my interest and sensibility. Fascinating stuff! Wouldn’t it be wonderful if we had a major Viking site in Ireland that is above ground! Beautiful objects and I look forward to seeing them in the book! Great article….looking forward to visiting sometime. Looks like a wonderful addition to any library. Looking forward to reading it! Eve, unfortunately you have the wrong Woodstown. The Viking site is further upriver, past Waterford city and near Mount Congreve. A lot of people make the same mistake. a brilliant find …thank you for sharing this with us! Would gladly add this to my collection! So appreciative of those who dig and give a human context to ancient objects and then share their finds through the internet. A milestone publication in the history of the Viking activity in Ireland. It illustrates very clearly why so many of us archaeologists do what we do. This publication looks very interesting. I seen the display at Reginalds tower a couple of months ago, and I would love to see more detailed images of these artifacts. Great post, and I would love to win the book! This book would be a welcome addition not to mention a valuable resource for the fourth and final part of my ‘Viking’ presentation in college. Oh, the book looks gorgeous. Is it all right that I am much more interested in getting it that I am in the latest celebrities gossip? Great discovery, well done to the team! The article does not mention anything about the individual himself in the richly furnished grave. Was he the only skeleton found? Are they conducting any reasearch into the diet, origins, health and pathology of the human remains? As a bioarchaeology student I would love to know more!! I love the Irish & Uk Viking culture and stories. I live on the Wirral which was once a Viking stronghold in the 7th-9th centuries. Land was given to the Vikings to make a settlement by the Earl of Chesters wife and they stayed and prospered for many years. Also it is believed that the last great battle between the Saxons and Irish Vikings and Scots was held on the Wirral in a place called Bromborough which could of come from the name Brananbach from which the battle. was called. I want that book to be shipped to my home Sweden. This looks fascinating. I’ve spent 20 years studying American history and the last one devouring stuff like this. We have lots of Norse discoveries in Canada as well: http://bit.ly/1qLvcA6 . I would love to read this book of Woodstown. Looks like great read. Let me get in on this…id read that book in 20 mins flat.. Seems more and more people are interested in Viking Culture because of the television show. This article and books like the contest offers are great next steps for the serious student. So glad you will disseminate to at least 3 lucky readers! Do you know yet how long the site was occupied for ? and was silver mined in Ireland at that time ?, or is that contained in the Book ? Looks a very interesting read. Makes you wonder how much has been lost and how much is still to be discovered. Really enjoyed the article, would love the book! Outstanding work….leads one to look for more!! It’s strange to note that the religious plate supposedly taken as spoils from a raid are of Islamic origin. How did they get to Ireland when the second Viking occupations ended about 980 AD but the first Crusades took place between 1096-99? Why would a Christian Monastery or Church have such (pagan) articles if they weren’t themselves spoils of war? My DNA says I am 38% Irish and 9% Scandinavian. Some of these ancestors were from the Dungarvan/Waterford area. Could the story of Woodstown be part of my story? Who knows, but I would like to learn more about this part of Irish history. I’m doing a lot of research on Vikings at the min and would love this! Love the Facebook posts, keep up the good work, Thanks. Love the images of the lead weights! Beautiful images of artefacts in this article! Very well done. This looks excellent.The site is a national treasure and some day wouldn’t it be fantastic to have part of the site opened as a visitors centre. The book look great and look forward to learning about our Viking past! What a fantastic publication, hopefully its just the start, if this is 4 years work what else is out there? Government funding should be provided for further study, even on its discovery has a major historic study been done on the river Suir? Best of luck for the future! There should be a copy of this book in every house in the South-East! If only everyone had a bit more interest in our history we could find out a lot more about our past and discover more places like this or even discover Woodstown more! An excellent site and one of the most important in our understanding of early urban settlement in Ireland. Fascinating stuff!! This blog is clearly a labour of love, and is itself quickly becoming a national treasure! While I have no qualifications or experience in archaeology, and have never been to Woodtown, I am fascinated by it. I am absorbed by archaeology’s potential to open a widow on the past and connect it directly to the present. For example the orginal fragment of verse you quote and link at the start of the article above (a variant of the translation is below) uses words from Old Irish that are clearly recognisable in modern Irish (innocht/anocht/tonight, fairggae/farraige/ocean). And that brief note written in Old Irish in the margin of a 1200 year old greek grammar manuscript is possibly the first documentation of where these Viking invaders were coming from: “Lothlind”. Which has been translated as ‘lakeland’, referring to Scandinavia, possibly Norway. And this word, moulded by over a thousand years of human pronunciation, survives today in the 21st century in the Irish surnames O’Loughlin and McLoughlin. It is that interlinking of literature, artefact, archaeology and continuous links from previous generations that suggests to me that I might enjoy this book very much…….. were I lucky enough to get a copy. ……. Regardless, thanks for another great article and keep up the good work! by the fierce warriors of Lothlinn’. I’ve been fascinated by Irish archaeology since my trip to western Ireland last year. Would love to learn more with this book! Great article and always enjoy your blog. Would love to read the book! The book would make a great addition to the library! I live across the river from the Woods town site. My family have lived in this area for at least 2-3 centuries. The ferry at Granny lies close by as does the Castle and there has been human activity along the riverside for the past 9,000 years according to the archeological evidence discovered before the construction of the city bypass. The Down survey is also a great insight to this historically rich area. All of this activity and the Suir still flows on to meet her sisters by Hook and Crook. Great article about an amazing site, I wonder how many slaves and how much booty passed through here, and were there ships from different nations coming here to trade with the vikings? I’m originally from the area and its fascinating that this lay hidden for so many years, how many more sites like this are there waiting to be found? This book looks really informative, as a Viking re-enactor and as an archaeologist. Though my focus is mainland Britain it would be really good to further my knowledge and add this to my library. Be your friend’s true friend. Are they sure it’s a shield boss and not a piece from a viking age Madonna’s costume? Amazing article that just gives additional credence to the history and genetic make-up of the Irish people and country. Beautiful setting for a city – most of the fields along the river are low lying and so can get waterlogged. This site has a good dry slope. Now if they would only open it to the public! It is amazing how well preserved the artifacts are. I would like to know more about the defenses of the town and how it compared to other defensive structures in Ireland and elsewhere. My father’s family is from Ireland and through DNA testing we found out our ancestry is 90% Nordic Viking. Also, as a medievalist I would love to read this book. Sounds very interesting. I thoroughly enjoyed every dys work on this fantastic site, and am sure there is still much more to be discovered there. A brilliant book, hope to get to read it eventually. Great article! I love when these show up in my email. This book looks very good – would love to have a copy! OK, I am a science writer and editor and have a background in fluvial geomorphology and a general interest in medieval culture . With great hopes, I took a good look at the book and read several chapters when it first arrived at the Waterford Library. I was amazed at a number of little oddities. For instance, while Niall Byrne’s The Irish Crusade is quoted and cited, the reference does not appear in the bibliography. I checked the library’s copy of Byrne’s book because the topic discussed pointed to his work and yes they have the correct details including page number for that topic, but no bibliographic information about the source. In this information age that means the book does not receive any credit on meta inventories for the info used. Also the historic timeline includes around two dozen significant events such as the first documentation of Viking arrival, the beginning of Waterford City, and the discovery of the Woodstown artefacts, etc., but then includes the hiring of Maurice Hurley as an editor. That made me laugh out loud. Also the chapter on the geology, geography, and environment of the Lower Suir and Waterford region, which I was hoping would be a great source of information and reference for further research, is short and light. It seemed like a lost opportunity because that kind of information often serves as the basis for many researchers and others to look for this type of publication and then cite it in their own writing. Am I nitpicking? Yes, I am: because that what science (including archaeology) is all about. The Woodstown excavations pushes open a door to a fascinating part of our past . The book illuminates the story ! Very interested in the finds as I carve viking age reproductions and lecture on the Viking age to schools and civic groups. Thanks for sharing the info, hope to get to see more!! Great discovery and publication. Congratulations to all in involved. Would love a free copy! I was with the ACS crew when the site was discovered – a fantastic catalogue of archaeology – would love to win this!!! Great article about a truly fascinating site. The publication is an essential read for anyone interested in the story of the early phase of Viking Ireland. I would definitely love the chance to win a copy of this book! So very interesting! I look forward to learning more. Looks like a very interesting book. I would love to read it. The Vikings really have had a bum historical rap, so it’s exciting to see a new book that will shed more light on what they were really like. I look forward to reading it. Great summary of an amazing site! Would love a copy of this book to update my research. Thank you for producing a great informative book about an amazing site and its artifacts. Fascinating story behind this heretofore unknown, or at least forgotten Viking settlement. How come there was so much silver ‘trading pieces’ left behind? Were they buried for safe-keeping or lost in a chaotic event? Why did the settlement cease to exist? Lots of mystery here for an Irish Time Team. Sounds like a fascinating archeological site and book. I recently found out I’m of some Irish heritage. I’m looking forward to learning more about Irish history. Thanks! This book would be an amazing addition to my growing library of County Waterford history. I find the discovery of the settlement and subsequent treasures unearthed totally fascinating. My grandmother Anastatia Hurley came from Killoteran County Waterford. What a lovely book! 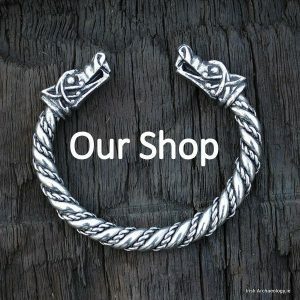 A great resource for those of us with an affinity for the Irish Vikings! Looks like a fantastic book, used to walk my dog out in woodstown when the railway track was being built. Fascinating to think of the history we were walking on. I just love that swod blade, as well as hilt; what a work of art! I’ves are another subject, too, and been studying both the Celts and the Vikings, seems this woven pattern is to been seen as far south as Spain. Fascinating how these cultures effected each other, and how it shows up now, in the artefacts. The longphorts are another subject, too, and the ‘Irish Viking’ economic ventures – slave trade. A visit is a must do when I get over in June. Your book looks fantastic. Congratulations! would love to be included in the draw for the book, please. 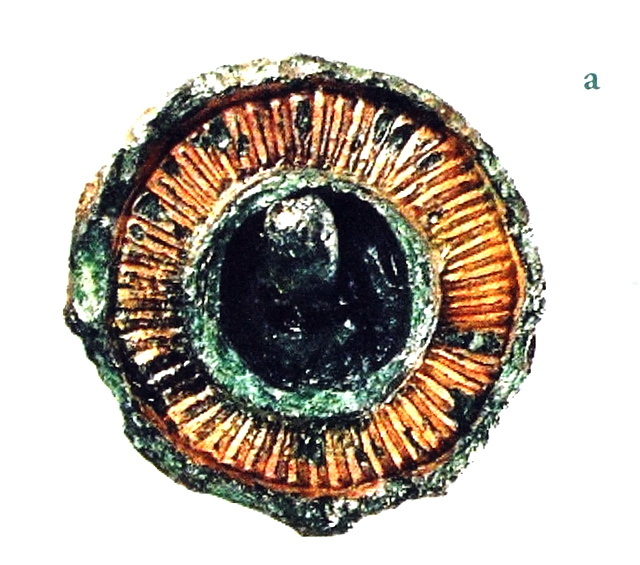 The pictures of the lead weights/whorls labelled as spindle whorls caught my eye, as that is my particular area of interest currently, spindle use and textile creation in the past, esp Viking and Irish. This covers both! Looks great, would love the book. Fascinated with all cultures pre-christian I was searching for information about ancient musical instruments used in battle and celebrations, and found this report.Great read about great discoveries that help to clear the fog between the past and present.